If there was any shred of doubt left, last night cemented that the HBC has clearly regained his swagger. Last night’s weekly call-in show – normally a dry, coachspeak preview of this week’s opponent interspersed with sometimes imbecilic fan questions – provided Coach a public forum to unload on a certain unnamed columnist at an unnamed Columbia based newspaper. And boy did he ever unload. Using a tone and language usually reserved for Seminoles or Volunteers during his Gator days, Spurrier ripped into this so-called columnist with venom and fire. The message: Enough is enough. No more unresearched columns designed to denigrate our program and the character of the HBC. No more outrageous comparisons to Penn State. No more back-stabbing from the home town paper. As we all know, this feud between coach and writer has been going on for quite some time. It started with the Bruce Ellington “poaching” comment, continued with an accusation that coach callously and carelessly played an injured Connor Shaw, and culminated with a comment that the program was starting to resemble the one at Penn State. For years our program has been pushed around by just about everybody-our conference foes, CTU, the media, you name it. It’s long been “sport” to take pot shots at the moribund USC football team. Well, things are a changin’. Yesterday was a landmark moment in the evolution of the program. 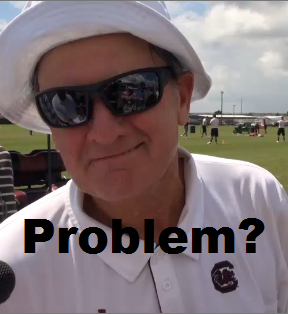 The HBC’s rant was a statement that we are becoming, dare we say it, Big Time. For years the football team needed the local paper for publicity. Now, it’s clear that the worm has turned. The paper, faced with a shrinking readership and competition from all sides, needs the football program (and the other USC sports programs as well). There’s no denying that the sports page is by far the most important section of the paper. Heck, on some days they don’t even publish other traditional sections. Yet, they can’t help themselves. They can’t seem to break from the days when all they had to write about was the negative stuff. You would think that the paper would embrace the recent successes and rejoice in the fact that we finally have a coach who has an idea or two about how to win a football game. In addition to winning, the HBC is (or should be) a newspaper man’s dream. He speaks off the cuff and oftentimes gives the best quotes in the business. The folks at the paper should realize that they have it pretty damn good under the circumstances. But what do they do? They try to screw it all up by allowing a guy to repeatedly attack the character of the HBC. While coach has his faults (well, don’t we all), I don’t think there are too many folks in the world of college football who would question his character. We at TRC love the HBC and what he stands for. He’s called the Head Ball Coach for a reason. In many ways he’s a throwback to a different era of college football — an era when the players answered yes sir and no sir. Yesterday he half way threatened to leave if the local paper continued to allow moronic columns by moronic columnists. Yesterday he drew the line.